First, a pic to those who love miles. 24,000 miles over the last 22 years. Fun! I tend to be on the low side of miles for a once to three times a year marathoner type; especially since 2010. 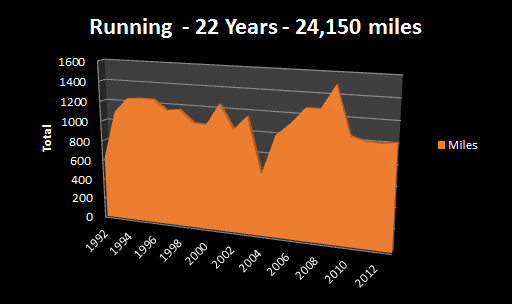 I’m right at 1,000 miles of running each year (1,020 in 2013 and 1450 to 1700 overall the last five years). Those running miles are 1/2 to 1/3 of most marathoners. 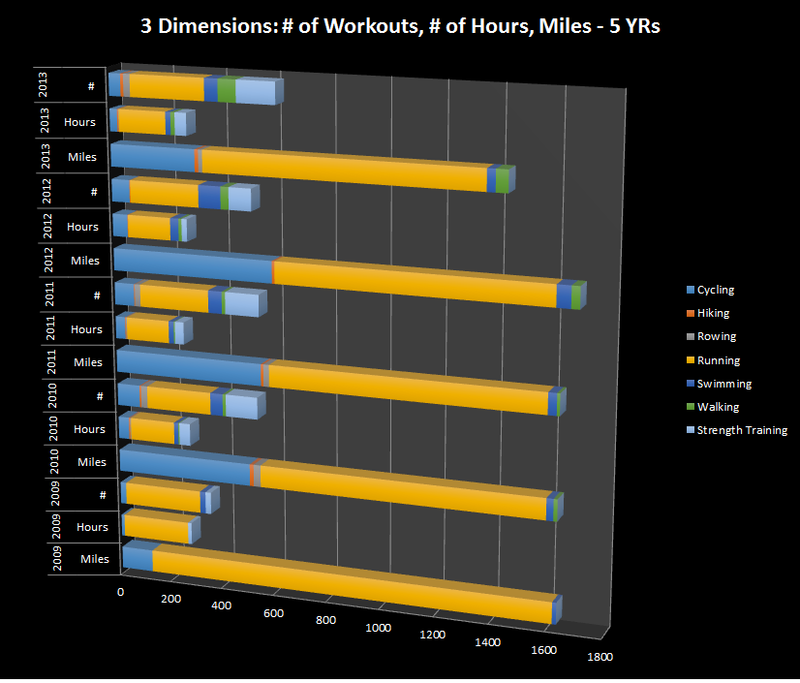 The reason for this lean mileage approach is increased reliance on strength training (CrossFit, Starting Strength, Metcon, Body Weight, Boxing, etc) and plenty of cross training. Related, is the desire to keep healthy. While not true of every runner, I do find an increase in injury and illness risk from unrelenting mileage. I also have been able to keep at a happier weight in my mid 160lbs and avoid the “marathoner gut” weight level of 185lbs. So in my late 40’s I’ve found that mix of exercise that works best – both in form and time. Yours is likely different. Just find that happy place and balance. More on that balance, with other demands in life, it’s strangely consistent that I can crank out 5-7 hours a week of working out. Sometimes it’s hit, miss or around or during kids’ event; while traveling, picking up what I can almost anywhere and anytime. 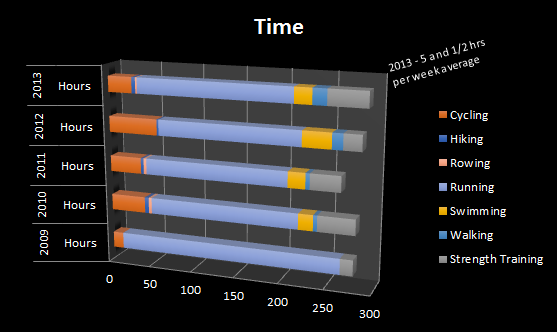 Based on that measure, I hit a high water mark of 290 hours in 2013. That translates into about 5 hours and 1/2 hours a week. Some weeks topped 10 hours, others were 2. A strength training intensive week – lots of lifting – typically translates into less time. During the 10-14 week prep for Pikes Peak, more time each week is on the menu. I’ve found a benefit of much improved core, pillar, whole body strength in my 40’s – is much smoother adaptation. So ramping up miles on bike or feet does not kick the snot out of me into to DOMs (delayed onset muscle soreness). Attaining marathon times of 4 hours to 4:24 since 2010 has involved much less pain the following days than marathons from 4:33 to 4:55 from 2006-09. Another benefit is there’s more to life than marathons – so all times from one mile to 1/2 marathon have improved. As I look at my “athlinks” profile I’m actually much better suited for 5k, 10ks and 1/2 marathons. Run Lincoln Marathon well. Hit Pikes Peak Marathon PR! Workout 6 hours a week. Snag at least 3 PRs across any event (run, bike, swim, strength) – could be a 5 mile run, 25 unbroken strict pull-ups, sub 32 50 meter swim. Who knows? Run one ultra again (fun because I don’t care about time on those). Volunteer at 5 or more events. Have fun! Enjoy those I workout with and workout with those I enjoy! What are you goals? I would like to know.